The Hydraulic Injector Comparator HA230 is a stand-alone machine designed to test hydraulically actuated electronically controlled injectors. 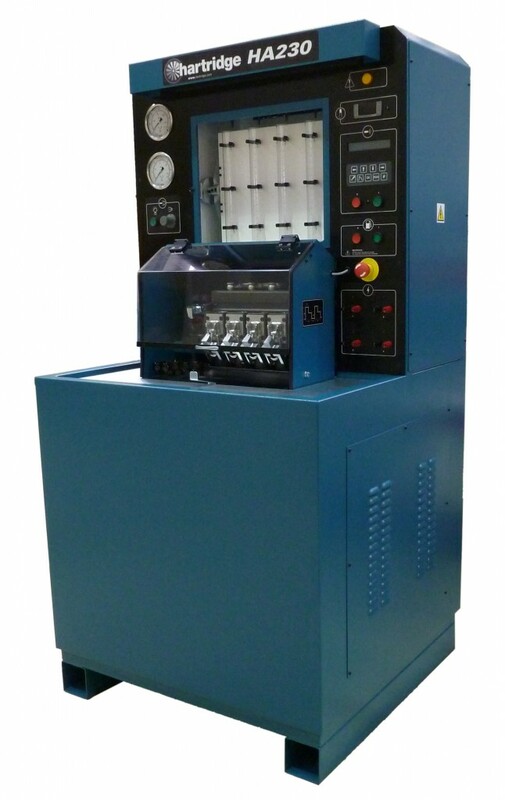 It features a graduate metering system and comprehensive electronic controls, enabling a full range of tests to be performed on up to 4 injectors at a time. The machine incorporates a single test oil supply, temperature controlled, with fuel and hydraulic pressures controlled individually. An additional injector nozzle spray check station enables the injected fuel spray pattern to be viewed by the operator. Rapid set up and operation. Effective viewing of the injector nozzle spray pattern. Drive System 7.5kW test oil system drive motor. Fully variable between 0 – 60 psi (0 – 4 bar). Fully variable between 300 – 3000psi (20 – 200 bar). 15.8 US gallons (60 litres). Calibration System Open top graduates on a turn over plate mounting with 4 by 38ml and 4 by 260ml graduates. Other Instrumentation Analogue gauge, 0 – 80psi (0 – 6 bar). Analogue gauge 0 – 3500psi (0 – 240 bar). Injector Mounting The injectors are installed for testing in rigidly mounted injector sleeves. Four sleeves are provided for flow comparison testing. Quick-release clamps retain the injectors. Dummy injectors blank unused injector positions. Injector Signal Connections The four signal cables are provided with the machine, and plug directly into numbered outputs on the machine fascia. Each output has a signal LED to help diagnose faulty injector solenoids. A single horizontally positioned injector mounting entering an air-extracted, illuminated spray chamber enables the injector nozzle spray pattern to be checked. Hartridge is committed to developing additional accessory kits and injector control parameters for further injector types, subject to customer demand. 90/120psi, 0.2cfm (6 – 8 bar, 2.4l/min). 2 US gals/min, 70ºF max, 60psi pressure. 33.5 x 30inches (850 x 770mm). The Hydraulic Injector Comparator HA230 is designed to be run on single test oil providing both the low and high pressure supplies to the injector. The test oil used therefore needs to have added lubricating properties, and for this purpose Hartridge recommends Rock Valley C-3112 Type 2 Calibration Fluid.